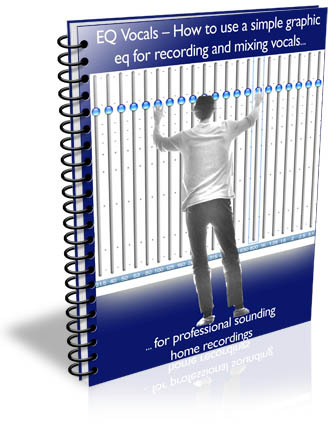 Get More “Easy, Pro-Quality Home Recording” reports FREE. Hi everyone. It’s been fun putting this special section together for you on simplifying the process of how to eq vocals using a simple graphic equalizer. It’s pretty comprehensive because I wanted to take you right from the very beginning of a new project from the moment one decides to create a new recording right to the finish line EQ-ing the vocals and mixing them with the rest of the tracks. I always believe it’s so important to create good working habits because it breeds true confidence and ultimately, much better recordings. I’ve recorded one of my tunes for this section and we’ll be looking at the steps that were used in EQ-ing the lead vocal, as well as how the many background vocal layers were EQ-ed and mixed. I think it will be useful for you to have this topic targeted and put all in one section like this. What’s covered in the above video? 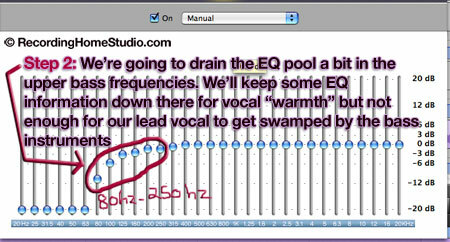 When it is time to eq vocals, you’ve already got a deep well of knowledge that you may not be aware of. The great news is you can tap into this well of existing knowledge to make learning quicker and to get better results when you are tackling something that you are unfamiliar with or something a little outside your comfort zone. Yes, the mic you choose matters. Because, vocal EQ is a lot quicker and easier if you make sure to use a decent mic that doesn’t unpleasantly “color” the sound of your vocal. BUT, you don’t have to spend a ton for a good mic. I use the mic shown in the picture below, and the EQ adjustments once I’ve recorded a vocal are pretty minor and straight forward, which saves hours of time during the course of a recording session and mix. TIP: Remember that every vocal for each song you record will be EQ’ed a little differently because each song will have a different “color,” mood and instrumentation that will determine how its lead vocal should sound and how it should best fit in the mix. Here’s how this works: Many new tasks are directly relatable to everyday things you already know how to do. So, the trick is to find similarities in the new tasks you are learning with everyday stuff you already understand. Because ultimately, everything you do is connected and comparable to something else you do. When you create the habit of taking a few minutes to find these connections and comparisons, it makes your brain more receptive and learning, improving and mastering the new task much faster. We’ll use this technique to create real confidence next time you eq vocals. 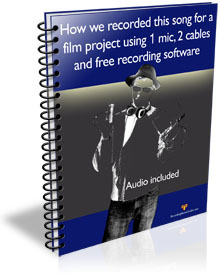 And very soon, you’ll be able to count on making great sounding vocal recordings and mixes every time. What I’m trying to say is that, in a way, you already know how to do all of this. I know… it’s spooky. 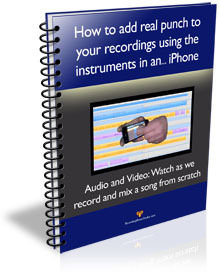 But really, we’re just re-using the mental tools you already have from one everyday task and putting these mental tools to use in your recording and mixing. 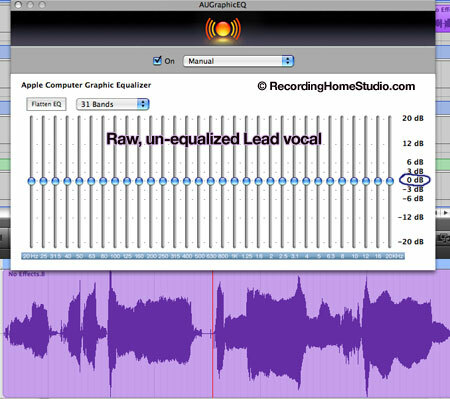 What everyday task can we compare to EQ-ing vocals that’ll make the recording process easier and clearer for our brains? 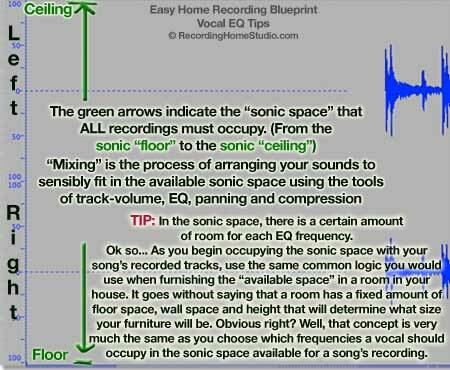 Let’s see… because any kind of audio recording has to occupy the same size sonic space, let’s compare eq-ing and mixing our recorded tracks to furnishing and decorating a room. 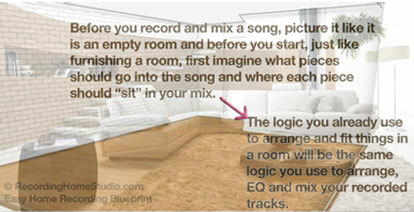 Because the common sense that goes with placing and arranging your stuff in a room is very similar to choosing, placing and controlling how your tracks will each sound in your recording. same place in your room without things becoming messy. out the measuring tape so we buy the right size. TV? How big? Where will it go? plant then. Yes, now the plant will fit. pre-production for recording our music. With good mental pre-production habits and clear visualization of how the recording should sound when it’s done, and then knowing how to actually achieve the results we want, we’ll be solving many potential problems before they even have a chance to happen. 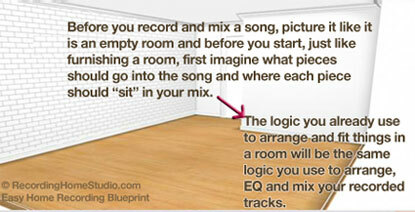 be placing our parts (i.e “mixing”) based on their size (i.e “volume”), shape (i.e. “EQ”) and position (i.e. “panning”). “Hear” the finished song in your head before you even start recording. recording to ask yourself for some specifics. What should the instrumentation be for this recording? How should the lead vocal sound on this recording? project. That’s a good position to be in at the beginning of a session. 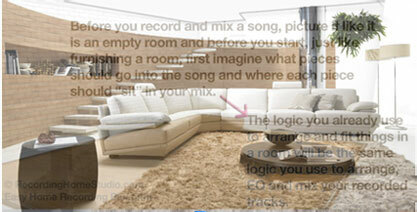 Pre- Recording Step 2: Choose an existing recording by another artist you want the sound of your recording to be like. sonic “model” as you eq vocals and mix your own song. reference “models” for the recording of one of your songs. 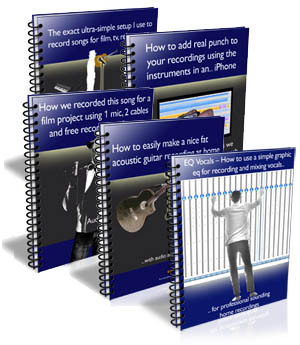 truly incorporate them for your own vocal sound and mix. mixing more than almost any other factor. 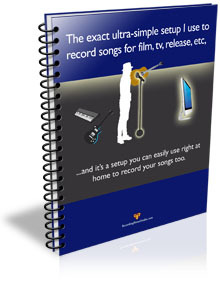 Tip: Stay true to your vision for this recording and version of your song. Don’t get put off track chasing alternate visions once the recording and arranging process has begun. Sure, make a note of your alternate ideas and pursue them later in another version, but focus like a laser and finish this version and reach your sonic goal for this version. comfortable little space in our mix. vocals for this recording in the ballpark of someone like Jason Mraz. good habit to prevent cluttered production, which sounds amateurish. added for this song. (In this case, it’s a simple keyboard part). As I said, I’ll add the rest of the band later. 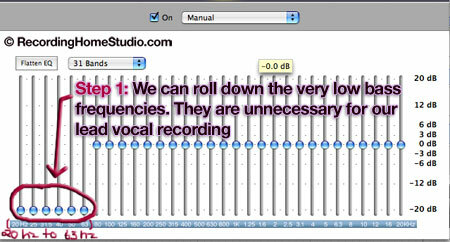 Before we eq vocals for this song, let’s listen to the raw, un-equalized vocal recording over the basic bed track. 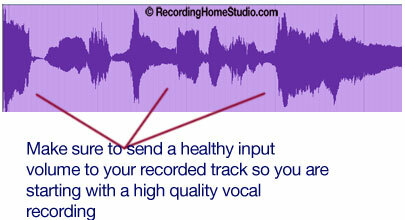 Tip: Make sure to get a good, healthy input volume going to the recorded track. Right now the EQ of this vocal is un-touched. recorded vocal to work with that shouldn’t need much work to sound good in our mix. Let’s keep going. the lead vocal with some EQ tweaking. space and it will become less and less clear. 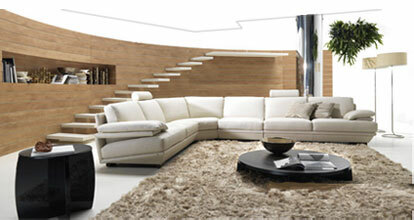 furniture thrown into a room. It’s no shock that it looks like a mess. place you have planned for it. that is clear, wide and spacious. to be down there anyway. The frequencies between 20hz – 63 hz are not doing anything to enhance our vocal. So we can pretty much roll them all the way down. STEP 2. 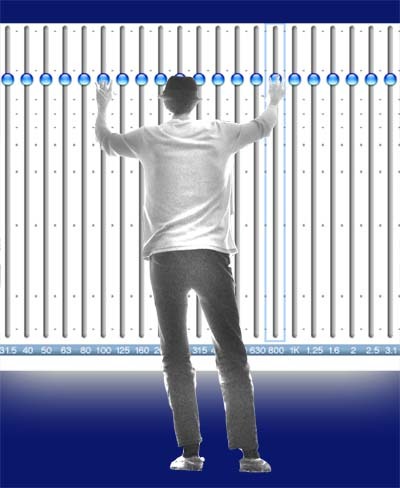 Let’s look at the upper bass frequencies between 80 hz – 250 hz. This is a busy EQ area with bass and drums sharing space down there and low part of guitars and keyboard parts, so there are a few tweaks we need to make to prevent “mud” in the low end. tangled up with the bass and drums and become un-defined and un-clear. end than it actually does. 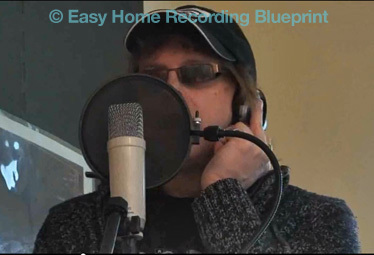 TIP: If you’d to learn more about “piggy-backing” frequencies, as well as everything you need to know to simply and affordably make professional quality recordings at home, download your copy of myEasy Home Recording Blueprint. 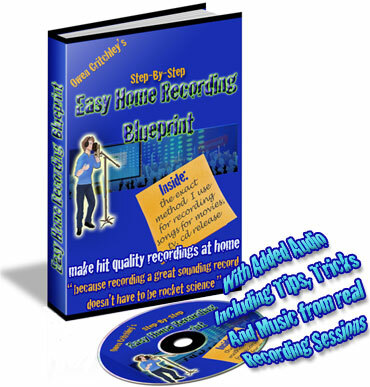 We have built a great “Blueprinter” community that is growing bigger every day and new success stories are coming in all the time as more and more great sounding music is getting recorded at home using the “simple, perfect method” of the Home Recording Blueprint. 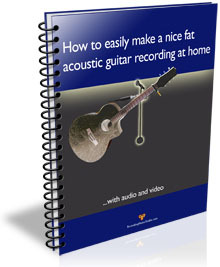 Or you can even start with my free home recording lesson series. STEP 3. Now let’s look at the low mid-range frequencies between approximately 250 hz – 800 hz. Depending on the mic used and even the tone of the voice of the singer, a recorded vocal can have a certain “boxy” sound that can rob the vocal of clarity and/or sound muffled. To deal with this we’ll always have a look in the low mid-range frequencies from approximately 200 hz to around 800 hz. 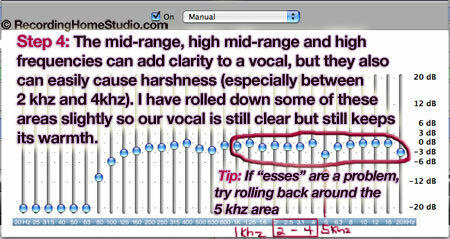 As you can see from the image above, a well recorded vocal normally requires only small adjustments in the various EQ frequency band, so make sure to have a light touch and listen carefully to your vocal by itself (solo-ed) and with the rest of the tracks. STEP 4. 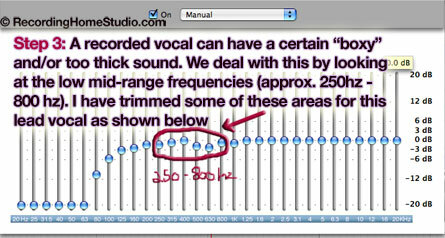 Ok, moving on to the mid- range, high mid-range and high frequencies as we continue to eq vocals for our example song. the most mis-used frequencies in self produced and/or home recordings. and can add a “quacky” and definitely amateurish sound to a vocal recording if they are mis-used. TIP: You will find that once you tweak the “boxy” frequencies (see point #3 above) you may not even have to do much in the high mid-ranges between 2khz – 4 khz. In other words, just by EQ-ing the vocal so it is less muffled in the low mid-range, the vocal will suddenly be clearer and seem like you’ve given it a high mid-range boost even though you actually didn’t touch it. It’s really very cool. 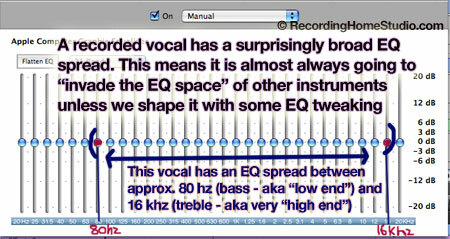 So, just remember when you EQ vocals, or any track for that matter, the various EQ frequencies affect each other. If you have a well recorded vocal using a decent mic, each EQ adjustment you make on the frequency sliders will normally be quite small. As you can see in the image above, I have rolled down some of these mid and high mid-range frequency areas slightly so our vocal remains clear but still keeps its warmth. Remember when I said that down in the ultra-low bass frequencies around 20 hz (hertz) that there is mostly useless rumble on a vocal recording? Well, way up in the ultra-high end frequencies of 20 khz (kilohertz) except, instead of rumble, we have the situation that, although there may be some sonic activity up there, human ears can’t really hear anything up there so we can roll down this frequency range as well. Actually, I probably could have rolled down that 20 khz slider on the far right even more than I did. But things are sounding pretty good, so I’ll leave it only partially rolled back for now. further, which is often what I end up doing. Ok, I’ve done a mix for you of our example song. Let’s have a listen. Because the lead vocal is now establishing and occupying its correct portion of the frequency range, any background vocals added don’t necessarily have to be as thick or bright as the lead vocal. The listener’s ears will give the backup vocals a kind of sonic “credit”. In a sense, the background vocals are piggybacking on the full rich tone of the lead and therefore the backups can actually afford to be a little duller and/or thinner than the lead vocal so they can avoid crowding the lead vocal’s EQ space. 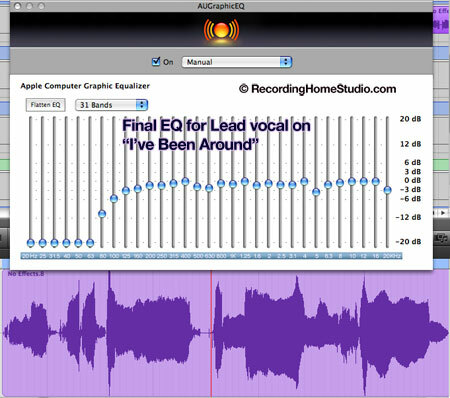 With the panning tool, we can further separate the backup vocals from the lead vocal. By being aware of this as we EQ vocals, we create a situation where all the various vocal tracks remain clear and distinct to the listener. 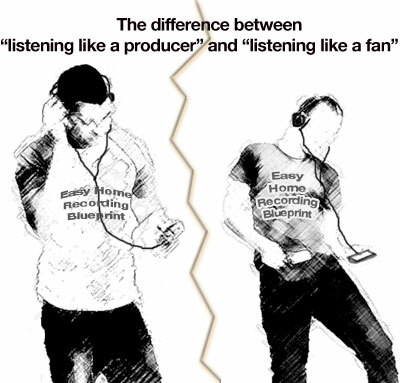 It makes their listening experience far richer and more enjoyable as they hear all the facets and little details of your song’s recording.